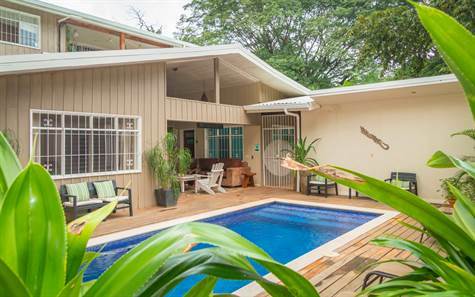 Just a few minutes walk to the beautiful beach in Playa Tamarindo Costa Rica lies this 7 bedroom 6 bathroom vacation home. The property is accessed through a large gate and is surrounded on all sides by walls, creating a wonderful, private feel. Home comes with a tile pool, patio area, covered outside kitchen with BBQ area, laundry room as well as covered parking with sliding electric gate. The master bedroom has a king-size bed and balcony, there is a bedroom with 1 queen bed, 3 bedrooms with queen and single bed and 2 bedrooms with 2 single beds. There are 6 bathrooms. The living/dining areas and kitchen opens up to the patio/living room and pool. The house has all the top shelf amenities you look for including washers and dryers, TVs, stereo and a fully equipped stainless steel gourmet kitchen to create your own spectacular meals in your own private paradise. The property has an excellent rental history as a single family home with short term rentals and is a moneymaker! It also has a history of renting out rooms. Additionally, this home is ready for a Bed & Breakfast. All the changes have been done to start right away!